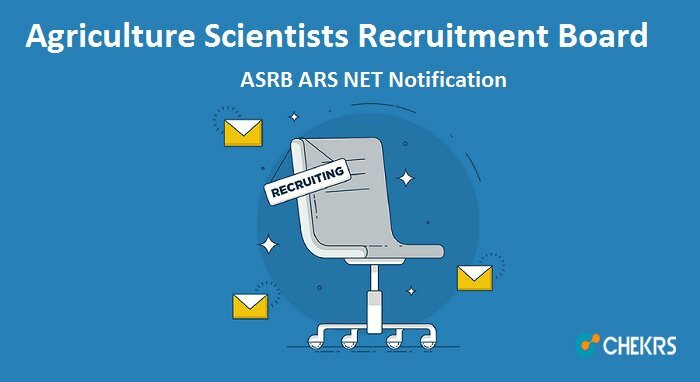 ASRB ARS NET 2019: Agriculture Scientists Recruitment Board (ASRB) has invited online application form to recruit Scientists in Agricultural Research Service and Lecturer/Assistant Professor in the State Agricultural Universities (SAUs) and other Agricultural Universities (AUs). Interested candidates’ may apply for the ARS NET Exam 2019 from the official portal on or before the last date. Candidates will be selected through an online examination which would be organized in the due course of time as specified in the notification. The examination will be organized in two phases- preliminary and main examination respectively. Other essential details such as rules of examination, selection process, age limit, application fee, ARS NET Online Application Form 2019 registration process, and minimum educational qualification are covered in below sections. The Agriculture Scientists Recruitment Board (ASRB) has been announced the Recruitment notification for the Scientists in Agricultural Research Service and Lecturer/Assistant Professor for Vacant posts. As per the notification information, Agriculture Scientists Recruitment Board is going to recruit Agricultural Scientist in combination with National Eligibility Test. NET (1). Interested candidates may apply for the ARS and NET recruitment within the stipulated time. As per ARS NET Notification 2019, no application form will be accepted after the deadline of online registration. Therefore, complete the registration process beforehand. Details of all the important dates and schedule of ARS Net Application Form 2019 shall be as follows. Agricultural Research Scientist and National Eligibility Test (NET-1) applications forms will be filled online. Candidates who are interested in to apply for both, they can apply for the same through the same official portal. Guidelines regarding the ARS NET Online Application Form are covered in the below section. The eligibility criteria for Agriculture Scientists Recruitment Board for ARS and NET exam are as follows. Candidates make sure to adhere to the eligibility criteria strictly, failing which may lead to cancellation of your candidature. Candidate must possess a Master’s Degree or equivalent degree from a recognized university as per the discipline for which a candidate is applying. Candidates who are holding Master’s degree from foreign Institute they may apply. Candidate must be between 21 years to 32 years. For age relaxation criteria candidate may refer to the detailed notification. Candidate age should not be more than 21 years. There is no upper age limit for the National Eligibility Test (NET). Selected candidates will be offered Rs 15,600-39,100 plus research grade pay of 6,000/-. Candidates can make the payment through Debit Card/ Credit Card/ Net Banking from any Bank before the last date. The Agriculture Scientists Recruitment Board (ASRB), has limited the number of attempts for ARS and NET examination. Information regarding the same is as follows. The number of attempts for Agricultural Research Service examination is restricted to six for Unreserved category candidates. And OBC/ Divyang (belonging to General/ OBC category) candidates could appear for the examination to 9 times. However, for SC and ST candidates there is no restriction regarding the number of attempts. Guidelines and online registration steps that are required at the time of registration shall be as follows. The examination dates of Agricultural Research Scientist and Net Eligibility Test will be organized on the following dates. Aspirants who have applied for the ARS recruitment they will be called for a computer-based test plus written test followed by viva-voce. Whereas, for NET recruitment only single written test of 150 marks will be organized. However, the controller of the examination reserve the right to change the selection process if required. Note: For more details about ASRB ARS NET 2019 refer official website. If you face any query while filling up the application form, feel free to discuss with us, our team will reply to you shortly regarding this. After selection where will candidate be posted? ?